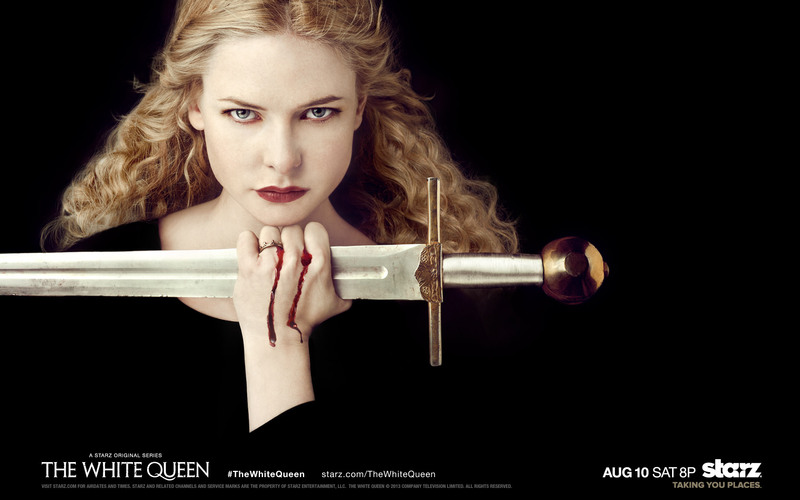 Following an established pattern on premium cable, The White Queen (Saturdays at 8 PM EST on STARZ) combines breathy, bodice-popping romance with hints of war, intrigue, and just enough period history to convince you your night hasn’t been a complete intellectual bonfire. Based on Philippa Gregory’s series of historical novels, The Cousins’ War, The White Queen’s milieu is England’s civil strife of the Late Middle Ages, otherwise known as the War of the Roses. As the Houses of Lancaster and York vie for the English throne, everyone from the French to the Scots looms off-screen, promising to make trouble in coming episodes. After all, even if there aren’t any actual “commercials;” this is commercial television. With the supposedly more scholarly History Channel running everything from Cajun Pawn Stars to Ice Road Ax Men to Mutant Neanderthal Strippers (2015? ), we can hardly expect a network that calls itself STARZ (with a Z!) to act as some sort of PBS Premium. All the ingredients for high ratings are there with The White Queen, except perhaps for its timeslot. Rather than sticking with Friday night for the airing of its original programming (a successful recipe for Spartacus, DaVinci’s Demons, and Magic City) STARZ will show The White Queen on Saturday nights, opposite the first-run movies on other premium cable channels. While this doesn’t amount to the kamikaze mission of going up against the likes of Homeland and Boardwalk Empire on Sunday nights, the change doesn’t entirely make sense. Maybe programming executives at STARZ have done their homework and see an opportunity. Only time, and ratings, will tell. With a breathtaking number of scenic transformations and costume changes sprinkled between bouts of vigorous soft-core, The White Queen focuses on the love of King Edward IV (Max Irons, son of Academy Award winner/Borgia Pope, Jeremy) and his future Queen-Consort, Elizabeth Woodville (Swedish beauty, Rebecca Ferguson). In the first one-hour episode alone, the action roves from woodland picnic to secret nuptials to a hunting lodge honeymoon that literally goes on for days. Tresses of hair flow, fields of flowers bloom, and there’s no shortage of bare, writhing flesh. There are, of course, moments when love takes a back seat, when intrigue rears its toothy head. For that, Irons and Ferguson give way to older sub-leads, most notably in the first several episodes, English actor, James Frain. Sneering from horseback, stalking through castle and field, issuing fiery pronouncements to his nephew the King; Frain (The Tudors and Elizabeth) plays Richard Neville, 16th Earl of Warwick. Known as “the Kingmaker,” Neville has been responsible for putting Edward on the throne. With courtly manners, a simmering will to power, and facial expressions that seem always to be hiding a scheme, the Kingmaker’s machinations promise to be a dramatic driver early on. The meat for a “real life” version of the game of thrones is definitely there, the history behind The White Queen covering a conflict Shakespeare himself devoted four plays to (Henry VI, 1-3 and the more famous Richard III). As the future Richard, Welsh stage actor Aneurin Barnard appears in only one scene of The White Queen’s first episode; however, the bemused malice he shows suggests a villain in the making, one ready to accept the mantle of principle antagonist from Uncle Kingmaker. Both history and The White Queen’s first season plot synopsis promise more of a role for Richard as the series unfolds. Beyond the usual genre conventions of beauty vs. ugliness and good versus evil, The White Queen seems to be looking for thematic resonance in its exploration of gender roles. As its advertising tagline reads, “Men go to battle. Women wage war.” Though this suggests grand ambition, the question remains as to whether there’s any “there” there. Thus far, women’s only real realm of dominance seems to be “magic,” a power that may or may not be real within the show’s cosmology. Only as the series evolves will we learn whether the show’s pretensions to fresh thematic territory are sincere or, like the treatment of history so common to its forerunners, easily dispensed with in favor of ratings. Either way, The White Queen’s top-notch cast and large production budget have produced something exciting to watch; a worthy successor to The Tudors and The Borgias, at least on a visceral level. A former international finance professional, Kurt Baumeister holds an MFA in Creative Writing from Emerson College. His first novel, a satirical spy thriller entitled PAX AMERICANA, is forthcoming. He is currently at work on his second book, LOKI’S GAMBIT, a modern fantasy told from the viewpoint of the diminished and fundamentally misunderstood Norse God of Evil, Loki. Kurt Baumeister lives in Virginia. This entry was posted in Uncategorized and tagged Film review, Kurt Baumeister, STARZ, The White Queen. Bookmark the permalink. My review of The White Queen. This was run initially by Okla Elliott of As It Ought To Be. Makes me want to see it. Great review! Thanks, Mia! The show has really grown on me. I think you’ll like it.